When it comes to restoring missing teeth, dental implants are truly the gold standard. Not only do they bring back the visible part of the tooth (the crown), but they also replace the root structure using a small titanium post. In the end, you get a tooth that looks, feels, and functions just like a real one, and patients can trust them to last for decades to come. 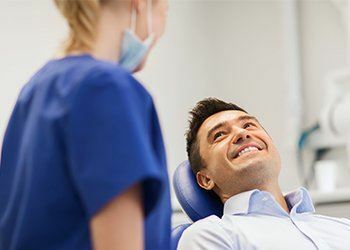 You can now get this state-of-the-art restorative solution right here at Powell Dental Group, and you’ll enjoy our unmatched level of service and care from beginning to end. To get started, contact us today. Why Choose Powell Dental Group for Dental Implants? Dental implant supported teeth are rooted firmly within the jawbone just like natural teeth, meaning patients don’t have to worry about them moving no matter what they are eating. And, implants actually stimulate the jawbone and encourage new growth in the area. This prevents and even reverses the bone loss that is common after tooth loss, which helps maintain a strong foundation for the rest of the teeth. Topped with custom-made porcelain restorations, no other treatment replicates the appearance of natural teeth better than dental implants. Unlike a removable denture, you can take care of implants just like your natural teeth. Regular brushing, flossing, and dental visits are all that’s needed to keep them looking like new. When it comes to durability, dental implants are in a league of their own. They can easily last for 30 years or more, and many patients are able to rely on the same implants for the rest of their life. Traditional bridges require the teeth surrounding a missing one to be filed down to hold the prosthetic, but with an implant-retained crown, we can literally slip a brand-new tooth into the smile without damaging any remaining dental structure. Implant-retained crowns can be placed throughout the mouth, but for patients missing multiple teeth in a row, just two implants can support up to four teeth in a row, providing a more conservative and cost-effective solution that still delivers high-quality results. Using just four to six strategically placed implants, our team can restore an entire arch of teeth with a denture that is anchored directly to the jawbone. 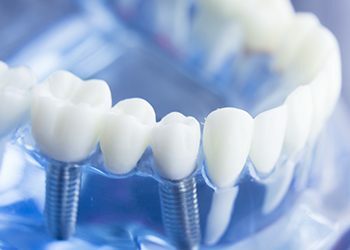 Compared to a traditional removable denture, implant dentures have a much stronger hold, last longer, and restore more of a patient’s bite strength as well. Every implant treatment begins with a minor surgery in which the new roots are placed into the jawbone, and we rely on a network of local specialists to complete this procedure. Each specialist has been handpicked by our team based on their experience and history of clinical excellence, ensuring that our patients’ new smiles will have a strong and lasting foundation. After the placement procedure, patients will return to Powell Dental Group to receive their new permanent teeth. Dental implants are designed to be versatile, so as a result, there is no fixed price for the procedure. 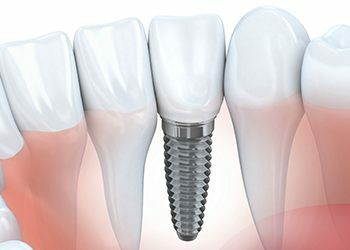 The number of implants a patient needs, what kind of restoration is used, and where the replacement teeth are located in the mouth can all influence and change the final cost (restoring the front teeth usually cost a little more than the back teeth). While dental implant restorations do cost more upfront compared to other options, their longevity actually makes them the wiser investment. Patients with regular bridges and dentures will need to replace them every five to seven years, while those with implants can rely on them for 30+ years. Over time, implant patients usually end up saving thousands thanks to not needing multiple retreatments.